Once is a phenomenon. Twice is a prediliction. 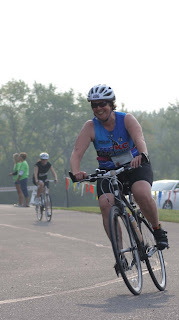 I entered the Olathe Medical Center Women's Triathlon for a few reasons: (1) To test how deep this sport has its hooks in me. 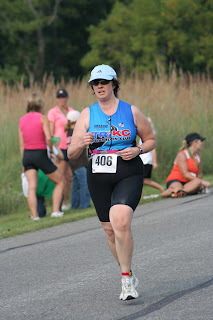 It might have turned out that I really don't love triathlon as much as I loved conquering the challenge. 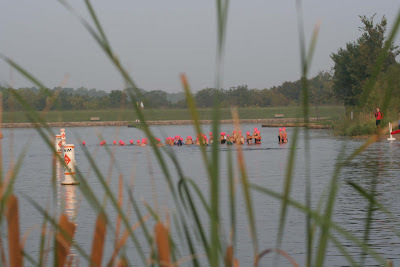 (2) To do a standing water start in optimal beginner's conditions - a smaller, all-women's field. (3) Hey, I had done all that training; seemed a shame not to race twice on the shoulders of that effort! Also the shirt is pretty awesome. And was the race fun? Was it ever! It just plain rolled me up in the fun rug and whacked me with the fun stick and beat the fun dust up all around me. So I got my answer to #1, above. The hooks are in. Everything went smoothly. The weather was good: overcast and in the high 60s, with water slightly warmed from the previous days' high temps. I made a transition bag pack list during the week, packed without panic the night before, and didn't forget anything. I was told in no uncertain terms by the scowling teutonic woman racked next to me that I was taking up too much space. But since I wasn't actually encroaching on hers or anyone's space (end of the rack, and the friendly woman on the other side and I had worked together to maximize space for both of us under our bikes - and nobody else's), I chalked it up to learning and vowed to be more economical next time. ("No negative energy! No negative energy!" says KZ when I see her in transition and begin to grouse about the scolding I'd gotten. "Besides, we love Germans. They gave us dark beer.") So I went back and made friends with my rack partner and we wished each other a good race. I love meeting triathletes! I love the energy of transition before the race! Though, you know, I suspect there's a lot more hugging and laughing in the transition area of local all-women's triathlons than other types of tri events. KZ and I jogged to warm up. Destination: park shelter women's restrooms with no lines. Points for pre-race efficiency! Still no electricity though. Was feeling very mellow, very rested, very relaxed. KZ on the other hand said she felt like a race horse straining to leave the gate. I applauded and envied her. I watched four swim heats bunch in the water and start. In their brightly colored caps, the swimmers out there looked like push pins going in and out of a gray bulletin board. The amazing Heather Gollnick, our guest professional, was the first one out of the water. Then the 40+ groupers went in to dip and wait in the cool water. And the air horn sounded. Wow. I could not get out of the tangle. Arms and legs all the way to the first buoy turn. And some woman out there is telling the story of how she got whacked on top of the head and apologized to. Aside from that, which necessitated a bit of breast-stroking to re-orient, the swim felt loose and long. It was still sloooooooow. But it felt good, not fighting the water. And since the parks department had cut the weeds for us, nobody got tangled in them. Thank you, JCPD! T1: Nothing out of the ordinary. 2:36. I can do better. It helped wearing a tri shirt - one less thing to think about. The first sharp hill out of transition, the one where I practiced hill repeats, was a piece of cake. I had trouble relaxing into deep breaths after the swim and the first bit of uphill after the park, but didn't slow down. So the first couple of miles of rolling hills were a chunk of work. (This is where the whacking with the fun stick starts.) People were passing me. I say out loud: "Just ride your race." Basically, I know I'll recover everything if I keep the cadence high. Cadence high = heart rate down. Then I made up time getting quickly up into the highest gear on the downhill and keeping it there as much as I could on the flats. The main thing is keeping the cadence high. Once recovered, I can hold onto higher gears going uphill. Was glad I'd ridden the course in practice. I still have to engage the drill sargeant voice in my head: "DRINK THE WATER, PAI! WHAT ARE YOU WAITING FOR!" I really would have liked two water bottles on this course. I think it would have helped me when I got to the run. I have got to order that Twofish cage for my top tube! I took the corners fast and hit the back stretch up the long, tough hill on Homestead. The high cadence pays off: I spin up the hill, passing women who'd hammered past me on the earlier rollers. One more hill, then turned into the park, where, unbelievably, women were coasting in with a half-mile to go. The bike - strong. Very strong ride around the sharp little rollers. I had so much fun on the bike that I wasn't even thinking about the run. This was an error. Split: 44:17, 14.4 mph average speed. 197th out of 301 on the bike (not counting Heather Gollnick, who did I mention? Is amazing). T2: 1:10. A full minute faster than last time. That'll get faster. My legs felt great. Like running in wet concrete, of course, but in a great way. And as soon as I hit the first hill out of transition, I says to myself: Uh-oh. We are walking up this hill if we're going to have any hope of finishing at a run. I hate admitting this, because I so badly want to report that I was strong and resolute. I hate feeling like the weak link. I really do. Going into the hill, I felt the first whisper of dizziness. And in my gut, not a whisper, but a cannonball. Cramps. Not a side stitch — that's negligible. An intestinal cramp. At the top of the hill I picked back up into a run. The next mile and a half would be downhill and flat. When I saw the mile marker up ahead, I checked my watch. What the — 9:45?! I'd WALKED, for goodness sake. Unreal. All I can think is that my turnover must have been really fast, because it felt like I was shuffling. After that I felt better about walking when I got right up to the puke point, which happened three more times. If my run rate was that fast, walking a bit would bring me down around a 12 minute mile, and hey, I'd proudly run that slowly plenty of times. By the time I was at the final uphill, I'd had a couple of cups of water and the cramp was dissipating. So I took the last sharp hill on a solid stride, and then had a big grin on my face when I turned for the magnificent, fly-down-the-hill-flags-waving-crowds-cheering finish. Was never so happy to see N. with his camera pointed at me. I kicked into what finally felt like a race pace. I came across the line and felt strong. Not just "hooray I finished" strong. I'd run the strongest race I knew how to do. I could feel it: I'd given a strong effort in this body on a tougher course than the first one. It was only later when I compared my times to others that I started second-guessing my effort. Not criticizing; certainly not berating! — but re-examining. Re-examining, especially, my mental toughness on the run. I'll tell you tomorrow what I think about placing low in a race. For now, I'll tell you that triathlon has its hooks in me. I can feel something new just out of my reach, and I have to stretch for it, because I want it so much: I am going to learn how to make a triathlon run feel as powerful as a regular run. I suspect that this will be amazing. Hi! I linked in from Shakesville a good long while ago and stuck around. It's a lot of fun to read these. I've been conditioning and practicing and conditioning some more, not for triathlon but for parkour - and it's the same way. I have only barely gotten the basics (I have a good solid roll...) but I want to stretch it a little further, figure out a little more, make my body move in ways I've never done before. The discipline may be different but the feeling is the same. @Sixwing - parkour! That's a thing of awe and splendor... it's interesting that you say "conditioning." Triathletes tend to talk about "training" and I'm always on the lookout for other ways to think of this concept. Be safe out there, have FUN out there, and find your balance of the two!